An Act to establish and rapidly implement regulations for state driver's license and identification document security standards, to prevent terrorists from abusing the asylum laws of the United States, to unify terrorism-related grounds for inadmissibility and removal, and to ensure expeditious construction of the San Diego border fence. 8 U.S.C. ch. 12, subch. I § 1101 et seq. Real ID Act driver's license and ID card compliance by state as of April 2019. The Real ID Act of 2005, Pub.L. 109–13, 119 Stat. 302, enacted May 11, 2005, is an Act of Congress that modifies U.S. federal law pertaining to security, authentication, and issuance procedures standards for state driver's licenses and identity documents, as well as various immigration issues pertaining to terrorism. The law sets forth requirements for state driver's licenses and ID cards to be accepted by the federal government for "official purposes", as defined by the Secretary of the United States Department of Homeland Security. The Secretary of Homeland Security has defined "official purposes" as boarding commercially operated airline flights, and entering federal buildings and nuclear power plants, although the law gives the Secretary the unlimited authority to require a "federal identification" for any other purposes. Title II of the act establishes new federal standards for state-issued driver's licenses and non-driver identification cards. Introducing rules covering "delivery bonds" (similar to bail, but for aliens who have been released pending hearings). On December 20, 2013, the Department of Homeland Security announced that implementation of Phase 1 would begin on January 20, 2014, which followed a yearlong period of "deferred enforcement". There are four planned phases, three of which apply to areas that affect relatively few U.S. citizens—e.g., DHS headquarters, nuclear power plants, and restricted and semi-restricted federal facilities such as military bases. On January 8, 2016, DHS issued an implementation schedule for Phase 4, stating that starting January 22, 2018 "passengers with a driver's license issued by a state that is still not compliant with the REAL ID Act (and has not been granted an extension) will need to show an alternative form of acceptable identification for domestic air travel to board their flight". Starting October 1, 2020 "every air traveler will need a REAL ID-compliant license, or another acceptable form of identification, for domestic air travel." As of April 2019[update], 46 states and territories have been certified as compliant, and 10 have been granted extensions. The Real ID Act started off as H.R. 418, which passed the House in 2005 and went stagnant. Representative James Sensenbrenner (R) of Wisconsin, the author of the original Real ID Act, then attached it as a rider on a military spending bill, H.R. 1268, the Emergency Supplemental Appropriations Act for Defense, the Global War on Terror, and Tsunami Relief, 2005. The House of Representatives passed that spending bill with the Real ID rider 368–58, and the Senate passed the joint House–Senate conference report on that bill 100–0. President Bush signed it into law on May 11, 2005. On February 28, 2007, U.S. Senator Daniel Akaka (D-HI) introduced the Senate Bill S. 717, "Identification Security Enhancement Act of 2007", subtitled: "A bill to repeal title II of the REAL ID Act of 2005, to restore section 7212 of the Intelligence Reform and Terrorism Prevention Act of 2004, which provides States additional regulatory flexibility and funding authorization to more rapidly produce tamper- and counterfeit-resistant driver's licenses, and to protect privacy and civil liberties by providing interested stakeholders on a negotiated rulemaking with guidance to achieve improved 21st century licenses to improve national security". The bill is co-sponsored by Senators Lamar Alexander (R-TN), Max Baucus (D-MT), Patrick Leahy (D-VT), John E. Sununu (R-NH), Jon Tester (D-MT). The bill was read twice and referred to the Senate Committee on the Judiciary on February 28, 2007. A similar bill was introduced on February 16, 2007, in the U.S. House of Representatives by Rep. Thomas Allen (D-ME), with 32 co-sponsors (all Democrats). The House bill, H.R. 1117, "REAL ID Repeal and Identification Security Enhancement Act of 2007", is subtitled: "A bill to repeal title II of the REAL ID Act of 2005, to restore section 7212 of the Intelligence Reform and Terrorism Prevention Act of 2004, which provides States additional regulatory flexibility and funding authorization to more rapidly produce tamper- and counterfeit-resistant driver's licenses, and to protect privacy and civil liberties by providing interested stakeholders on a negotiated rulemaking with guidance to achieve improved 21st century licenses to improve national security." On May 23, 2007, the House Oversight and Government Reform Committee referred H.R. 1117 to the Subcommittee on Government Management, Organization, and Procurement. A more limited bill, S. 563, that would extend the deadlines for the states' compliance with the Real ID Act, was introduced on February 13, 2007, in the U.S. Senate by Sen. Susan Collins (R-ME), together with Senators Lamar Alexander (R-TN), Thomas Carper (D-DE), Charles Hagel (R-NE), and Olympia Snowe (R-ME). On March 2, 2007, it was announced that enforcement of the Act would be postponed until December 2009. On January 11, 2008, it was announced that the deadline has been extended again to 2011. On the same date the Department of Homeland Security released the final rule regarding the implementation of the driver's licenses provisions of the Real ID Act. As of April 2, 2008, all 50 states either applied for extensions of the original May 11, 2008 compliance deadline or received unsolicited extensions. As of October 2009[update], 25 states approved either resolutions or binding legislation not to participate in the program. When President Obama selected Janet Napolitano (a prominent critic of the program) to head the Department of Homeland Security, the future of the law was considered uncertain, and bills were introduced into Congress to amend or repeal it. In 2009, the most recent of these, dubbed PASS ID, would have eliminated many of the more burdensome technological requirements but still require states to meet federal standards in order to have their ID cards accepted by federal agencies. In the United States, driver's licenses are issued by the states, not by the federal government. Additionally, because the United States has no national identification card and because of the widespread use of cars, driver's licenses have been used as a de facto standard form of identification within the country. For non-drivers, states also issue voluntary identification cards which do not grant driving privileges. Prior to the Real ID Act, each state set its own rules and criteria regarding the issuance of a driver's license or identification card, including the look of the card, what data is on the card, what documents must be provided to obtain one, and what information is stored in each state's database of licensed drivers and identification card holders. Title II of Real ID – "Improved Security for Driver's License and Personal Identification Cards" – repeals the driver's license provisions of the Intelligence Reform and Terrorism Prevention Act, enacted in December 2004. Section 7212 of that law established a cooperative state-federal rule-making procedure to create federal standards for driver's licenses. Instead, the Real ID Act directly imposed specific federal standards. After 2011, "a Federal agency may not accept, for any official purpose, a driver's license or identification card issued by a state to any person unless the state is meeting the requirements" specified in the Real ID Act. The DHS will continue to consider additional ways in which a Real ID license can or should be used for official federal purposes without seeking the approval of Congress before doing so. States remain free to also issue non-complying licenses and IDs, so long as these have a unique design and a clear statement that they cannot be accepted for any federal identification purpose. The federal Transportation Security Administration is responsible for security check-in at airports, so bearers of non-compliant documents would no longer be able to travel on common carrier aircraft without additional screening unless they had an alternative government-issued photo ID. These requirements are not new. They replace similar language in Section 7212 of the Intelligence Reform and Terrorism Prevention Act of 2004 (Pub.L. 108–458), which had not yet gone into effect before being repealed by the Real ID Act. Said cards must also feature specific security features intended to prevent tampering, counterfeiting, or duplication of the document for fraudulent purposes. These cards must also present data in a common, machine-readable format (bar codes, smart card technology, etc.). Although the use of wireless RFID chips was offered for consideration in the proposed rulemaking process, it was not included in the latest rulemaking process. DHS could consider additional technological requirements to be incorporated into the licenses after consulting with the states. In addition, DHS has required the use of RFID chips in its Enhanced Driver's License program, which the Department is proposing as an alternative to Real ID. Digital images of each document will be stored in each state DMV database. Section 202(c)(3) of the Real ID Act requires the states to "verify, with the issuing agency, the issuance, validity, and completeness of each document" that is required to be presented by a driver's license applicant to prove their identity, birth date, legal status in the U.S., social security number and the address of their principal residence. The same section states that the only foreign document acceptable is a foreign passport. The DHS final rule regarding implementation of the Real ID Act driver's license provisions relaxes, and in some instances waives altogether, these verification requirements of the Real ID Act. Thus the DHS rule concedes that there is no practical mechanism to verify with the issuers the validity of documents proving the applicant's primary address (such as a mortgage statement or a utility bill) and leaves the implementation of this verification requirement to discretion of the states (page 5297 of the DHS final rule in the Federal Register). However, the DHS rule, Section 37.11(c), mandates that the Real ID license applicants be required to present at least two documents documenting the address of their primary residence. The DHS rule declines to implement as impractical the provision of the Act requiring verification of the validity of foreign passports presented by foreign driver's license applicants as proof of identity with the authorities that issued these foreign passports (page 5294 of the DHS final rule in the Federal Register). Section 37.11(c) of the DHS final rule allows the states to accept several types of documents as proof of social security number: a social security card, a W-2 form, an SSA-1099 form, a non-SSA-1099 form, or a pay stub bearing the applicant's name and SSN. However, the states are not required to verify the validity of these documents directly with their issuers (e.g. with the employer that issued a W-2 form or a pay stub). Instead, the DHS rule requires the states to verify the validity, and its match with the name given, of the social security number itself, via electronically querying the Social Security On-Line Verification (SSOLV) database managed by the Social Security Administration. The DHS rule, Section 37.13(b)(3), specifies that the validity of birth certificates, presented to document the date of birth or to prove U.S. citizenship, should be verified electronically, by accessing the Electronic Verification of Vital Events (EVVE) system maintained by the National Association for Public Health Statistics and Information Systems (NAPHSIS), rather than directly with the issuers of the birth certificates (such as state vital records agencies). Each state must agree to share its motor vehicle database with all other states. This database must include, at a minimum, all the data printed on the state driver's licenses and ID cards, plus drivers' histories (including motor vehicle violations, suspensions, and points on licenses). Original legislation contained one of the most controversial elements which did not make it into the final legislation that was signed into law. It would have required states to sign a new compact known as the Driver License Agreement (DLA) as written by the Joint Driver's License Compact/ Non-Resident Violators Compact Executive Board with staff support provided by the American Association of Motor Vehicle Administrators (AAMVA) and as approved by state Driver Licensing Agency representatives. The DLA is a consolidation of the Driver's License Compact and the Non-Resident Violators Compact, which have 46 and 45 member states, respectively. The following controversial elements of the DLA are already in the existing compacts: a convicting state must report out-of-state convictions to the licensing state, states must grant license reciprocity to drivers licensed in other states, and states must allow authorities in other states access to driving records, consistent with the Driver Privacy Protection Act. The requirement in the law for interstate access to state license and ID data has not been included in the DHS criteria for certification of state compliance or progress toward compliance. The only system available with the capability to satisfy the Real ID Act requirements for database access is the "State to State" (S2S) system developed by the AAMVA and Clerus Solutions under contract with state motor vehicle licensing agencies ultimately funded by federal grants. A component of S2S is State Pointer Exchange Services (SPEXS), a central national database of "pointer" information about all Real ID compliant licenses and state ID cards. 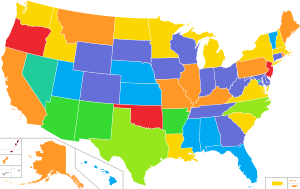 As of April 2019, 24 states were participating in S2S. New controversial requirements of the DLA are: (1) provinces and territories in Canada and states in Mexico are allowed to join the DLA and (2) member states, provinces, and territories are subject to reviews by DLA authorities for compliance with the provisions of the DLA. The DLA originated in concept with the 1994 establishment of a North American Driver License Agreement (NADLA) task force, and has created controversy among state representatives opposed to citizen data being shared with other countries. According to a 2005 analysis of the DLA done by the National Conference of State Legislators, the DLA defines "jurisdiction" to allow participation by a territory or province of Canada and by any state of Mexico or the Federal District of Mexico. The DLA can be amended by a vote of at least two-thirds of the member jurisdictions. On January 11, 2008, DHS released the final rule regarding the implementation of the driver's licenses provisions of the Real ID Act. Under the DHS final rule, those states that chose to comply with Driver's License provisions of the Real ID Act are allowed to apply for up to two extensions of the May 11, 2008 deadline for implementing these provisions: an extension until no later than December 31, 2009 and an additional extension until no later than May 11, 2011. The DHS final rule mandates that, as of March 11, 2011, driver's licenses issued by the states that are not deemed to be in full compliance with the Real ID Act, will not be accepted for federal purposes. The Secretary of Homeland Security is given discretion to determine the scope of such official purposes in the future. For the states that do not apply to DHS by March 31, 2008 for an extension of the May 11, 2008 implementation deadline, that deadline will apply: after May 11, 2008, driver's licenses issued by such states will not be accepted for federal purposes. DHS announced at the end of 2013 that the TSA will accept state identification cards for commercial flights at least until 2016. After the final implementation deadline, some non-Real-ID–compliant licenses continued to be accepted for federal purposes, if DHS determines that the issuing state is in full compliance with the Real ID Act by the final implementation deadline. However, in order for their licenses to be accepted for federal purposes, people born after December 1, 1964, were to have been required to have Real-ID–compliant cards by December 1, 2014, and people born before December 1, 1964, by December 1, 2017. In December 2014, these deadlines were extended to October 1, 2020. In March 2011 DHS further postponed the effective date of the Real ID Act implementation deadline until January 15, 2013. As of April 2019[update], 46 states and territories have been certified as compliant, and 10 have been granted extensions. As of May 11, 2005, several portions of the Real ID Act have imposed higher burdens and stricter standards of proof for individuals applying for asylum and other related forms of relief. For the first time, immigration judges can require an applicant to produce corroborating evidence (8 U.S.C. § 1229a(c)(4)(B). Additionally, the government may also require that an applicant produce corroborating evidence, a requirement that may be overcome only if the judge is convinced that such evidence is unavailable (8 U.S.C. § 1252(b)(4)). Restricting illegal immigrants or legal immigrants who are unable to prove their legal status, or lack social security numbers, from obtaining driver's licenses may keep them from obtaining liability insurance and from working, causing many immigrants and foreign nationals to lose their jobs or to travel internationally in order to renew their driver's license. Furthermore, for visitors on J-1 and H1B visas, the fact that visas may expire before their legal stay is over (this happens due to the fact that J-1 visas are issued with a one-year expiration date but visitors are allowed to stay for their "duration of status" as long as they have a valid contract) can make the process of renewing a driver's license extremely complex and, as mentioned above, force legal foreign citizens to travel abroad only to renew a visa which would not need to be renewed if it weren't for the need to renew one's driver's license. Although the new law does allow states to offer "not for federal ID" licenses in these cases, and that some states (e.g., Utah and Tennessee) have already started issuing such "driving privileges certificates/cards" in lieu of regular driver's licenses, allowing such applicants to be tested and licensed to drive and obtain liability insurance, the majority of U.S. states do not plan to offer "not for federal ID" licenses. In October 2007, then-governor of New York Eliot Spitzer announced that the state will adopt a similar "multi-tiered" licensing scheme in which the state will issue three different kinds of driver licenses, two of which comply with the Real ID security requirements and one which will be marked as "not for federal ID" purposes. However, following a political outcry, Spitzer withdrew his proposal to issue licenses to those unable to prove legal residence. An earlier law (Section 102 of Pub.L. 104–208 which is now part of 8 U.S.C. § 1103) provided for improvements to physical barriers at the borders of the United States. Subsection (a) of the law read as follows: "The Attorney General, in consultation with the Commissioner of Immigration and Naturalization, shall take such actions as may be necessary to install additional physical barriers and roads (including the removal of obstacles to detection of illegal entrants) in the vicinity of the United States border to deter illegal crossings in areas of high illegal entry into the United States." Subsection (b) orders the Attorney General to commence work on specified improvements to a 14-mile section of the existing border fence near San Diego, and allocates funds for the project. Subsection (c) provides for waivers of laws that interfere with the work described in subsections (a) and (b), including the National Environmental Policy Act. Prior to the Real ID Act, this subsection allowed waivers of only two specific federal environmental laws. Allows waivers of any and all laws "necessary to ensure expeditious construction of the barriers and roads under this section". Gives this waiver authority to the Secretary of Homeland Security (rather than the Attorney General). Waivers are made at his sole discretion. Restricts court review of waiver decisions: "The district courts of the United States shall have exclusive jurisdiction to hear all causes or claims arising from any action undertaken, or any decision made, by the Secretary of Homeland Security pursuant to paragraph (1). A cause of action or claim may only be brought alleging a violation of the Constitution of the United States. The court shall not have jurisdiction to hear any claim not specified in this subparagraph." Claims are barred unless filed within 60 days, and cases may be appealed "only upon petition for a writ of certiorari to the Supreme Court". Elimination of the 10,000 annual limit for previously approved asylees to adjust to permanent legal residence. This had been urged for years because the average asylee had a 17-year wait before he would be able to achieve legal resident status. As a result, in fiscal years 2005 and 2006, the backlog was greatly reduced as 147,131 asylees were granted legal permanent residence status. Usage of 50,000 unused employment-based visas from 2003. This was a compromise between proponents who had earlier tried to include all employment visas which went unused between 2001 and 2004, and immigration restrictionists. They were used, mostly in fiscal year 2006, for Schedule A workers newly arrived mainly from the Philippines and India, rather than for adjustments of status cases like the American Competitiveness in the 21st Century Act. (a) biological agent, chemical agent, or nuclear weapon or device. (dd) to a terrorist organization described in Clause (vi)(III), unless the actor can demonstrate that he did not know, and should not reasonably have known, that the act would further the organization's terrorist activity. This clause shall not apply to any material support the alien afforded to an organization or individual that has committed terrorist activity, if the Secretary of State, after consultation with the Attorney General, or the Attorney General, after consultation with the Secretary of State, concludes in his sole unreviewable discretion, that that this clause should not apply." As used in this paragraph, the term, "representative" includes an officer, official, or spokesman of an organization, and any person who directs, counsels, commands, or induces an organization or its members to engage in terrorist activity. Section 140(d)(2) of the "Foreign Relations Authorization Act", Fiscal Years 1988 and 1989 defines "terrorism" as "premeditated, politically motivated violence, perpetrated against noncombatant targets by subnational groups or clandestine agents". The Real ID Act introduces complex rules covering "delivery bonds". These resemble bail bonds, but are to be required for aliens that have been released pending hearings. The remaining sections of the Real ID Act allocate funding for some reports and pilot projects related to border security, and change visa limits for temporary workers, nurses, and Australians. Under the Real ID Act, nationals of Australia are eligible to receive a special E-3 visa. This provision was the result of negotiations between the two countries that also led to the Australia-United States Free Trade Agreement which came into force on January 1, 2005. On December 17, 2018, H.R. 3398 amended the Real ID Act of 2005 to clarify that a citizen of the Freely Associated States (FAS) when admitted in the US on a non-immigrant basis is eligible for a driver's license or ID card. This was in order to resolve an outdated term in the original REAL ID Act. The Freely Associated States includes the Republic of the Marshall Islands, the Federated States of Micronesia, or the Republic of Palau. Portions of the Real ID Act pertaining to states were scheduled to take effect on May 11, 2008, three years after the law passed, but the deadline had been extended to December 31, 2009. On January 11, 2008, it was announced the deadline had been extended again, until 2011, in hopes of gaining more support from states. On March 5, 2011, the U.S. Department of Homeland Security postponed the effective date of the Real ID Act until January 15, 2013, a move that avoided causing tremendous disruptions to air travel. State adoption and compliance has changed throughout the years as the final phase (Phase 4, Boarding federally regulated commercial aircraft) approaches and states are faced with potential air travel restrictions for their residents. ^ a b c d e f g h i j k l m n o p q r s t u v w x Participating in the interstate system for sharing of ID databases. On January 25, 2007, a Resolution passed overwhelmingly in the Maine Legislature that refuses to implement the Real ID Act in that state and calls on Congress to repeal the law. Many Maine lawmakers believe the law does more harm than good, it would be a bureaucratic nightmare to enforce, it threatens individual privacy, it makes citizens increasingly vulnerable to ID theft, and it would cost Maine taxpayers at least $185 million in five years because of the massive unfunded federal mandates on all the states. The Resolution vote in the Maine House was 137–4 and in the Maine Senate unanimous, 34–0. “ —the 'common machine-readable technology' required by the Real ID Act would convert state-issued driver licenses and identification cards into tracking devices, allowing computers to note and record people's whereabouts each time they are identified. —the requirement that states maintain databases of information about their citizens and residents and then share this personal information with all other states will expose every state to the information security weaknesses of every other state and threaten the privacy of every American. —the REAL ID Act wrongly coerces states into doing the federal government's bidding by threatening to refuse noncomplying states' citizens the privileges and immunities enjoyed by other states' citizens. Arizona, Arkansas, Colorado, Georgia, Hawaii, Idaho, Illinois, Louisiana, Michigan, Minnesota, Missouri, Montana, Nebraska, Nevada, New Hampshire, North Dakota, Oklahoma, Pennsylvania, South Carolina, Tennessee, Virginia, and Washington State have joined Maine and Utah in passing legislation opposing Real ID. Similar resolutions are pending in Alaska, Kentucky, Louisiana, Maryland, Massachusetts, New York, Ohio, Oregon, Rhode Island, Texas, Utah, Vermont, Washington, D.C., West Virginia, Wisconsin, and Wyoming. Other states have moved aggressively to upgrade their IDs since 9/11, and still others have staked decidedly pro-Real ID positions, such as North Carolina. Some states whose legislatures passed non-binding resolutions opposing Real ID are nonetheless working to comply with the law, such as Illinois. In announcing the new regulations, Secretary of Homeland Security Michael Chertoff cited Alabama, California, and North Dakota as examples of states that had made progress in complying with Real ID. On July 7, 2008, Puerto Rico's Governor Aníbal Acevedo Vilá announced that all 15 Puerto Rico Department of Transportation and Public Works Driver's Services Centers will implement a new system complying with the Real-ID Act. As of January 29, 2008, the Department of Homeland Security has announced $79.8 million in grant monies to assist states with Real ID implementation, and set an application deadline of March 7, 2008. On April 16, 2009, the Missouri House of Representatives passed the anti Real ID bill HB 361 to repeal section 302.171, RSMo, and to enact in lieu thereof two new sections relating to noncompliance with the federal Real ID Act of 2005 sponsored by Representative Jim Guest by a vote of 83 Ayes 69 Noes and 3 Present. On May 13, 2009 the Missouri Senate unanimously passed HB 361, 43 Ayes 0 Noes. Missouri Governor Jay Nixon signed this bill into law on July 13, 2009. This was later repealed in 2017. For the 2012 Florida Legislative Session, the anti-Real ID bill HB 109 and its Senate companion S 220 will be heard. Named the Florida Driver's License Citizen Protection Act, it would require discontinuation of several of the federally mandated provisions of Real ID and destruction of citizen's documents that had been scanned into the government database. That bill died in Transportation and Highway Safety Subcommittee on March 9, 2012. New Jersey planned to begin issuing Real ID compliant driver's licenses and non-driver ID cards beginning May 7, 2012, but was forestalled by a temporary restraining order issued on May 4, 2012 on motion of the ACLU. On October 5, 2012, the state subsequently agreed to drop its Real ID compliant license plan, settling the lawsuit brought by the ACLU. On July 1, 2012, Georgia began issuing Real ID compliant driver's licenses and non-driver ID cards. The increase in items needed to show in order to receive a license caused wait times to reach up to five hours. Although Hawaii had expressed opposition to some portions of the Real ID Act, it began requiring proof of legal presence in March 2012. Hawaii's updated driver's licenses and non-driver ID cards were deemed fully compliant by the Department of Homeland Security in September 2013. On November 12, 2014, Nevada began offering Real ID compliant driver's licenses to residents. Nevadans have a choice of a Real ID compliant card or a standard card with the heading "Not for Federal Official Use". On April 14, 2015, Arizona governor Doug Ducey signed a bill allowing the state to begin the process of making Arizona driver's licenses Real ID compliant. Work on creating the driver's licenses has already begun, however the Arizona Department of Transportation has requested an extension on the implementation so that residents can still use current ID past the January 2016 deadline to board a commercial flight and implement Real ID when the state is ready. On March 8, 2016, the incumbent governor of New Mexico, Susana Martinez, signed House Bill 99 into law, hence bringing New Mexico into Real ID compliance. The New Mexico MVD began issuing Real ID compliant driver's licenses and identification cards beginning November 14, 2016. On March 1, 2017, Oklahoma Governor Mary Fallin signed HB 1845 as the first bill signed in Oklahoma's 2017 legislative session, bringing the state into compliance with the Real ID Act. On May 18, 2017, Minnesota Governor Mark Dayton signed legislation to bring Minnesota into compliance with the federal Real ID Act by October 2018. The California DMV started providing federal compliant Real ID driver licenses and ID cards as an option to customers beginning January 22, 2018. However, on December 24, the Department of Homeland Security has notified the California DMV that their Real ID driver licenses are not Real ID Compliant. This is because the California DMV has been requesting one “Proof of Residency” document as opposed to the minimum two as defined under Federal Law. The California DMV responded stating they will begin asking for two Residency Documents beginning in April 2019. Any Real ID Driver License or Identification Card issued before April 2019 will still be valid, however, when the applicant’s Real ID comes up for renewal, they will be required to submit an additional Residency Document to comply with the Real ID Act. The Massachusetts RMV also started this option on March 26, 2018, and the Ohio BMV on July 2, 2018. Along with the Bush administration, the Real ID Act is strongly supported by the conservative Heritage Foundation and by many anti-illegal immigration advocates. However, the Real ID Act has faced criticism from across the political spectrum and remains the subject of several ongoing controversies. Opponents of the Real ID Act include libertarian groups, like the Cato Institute; immigrant advocacy groups; human and civil rights organizations, like the ACLU; Christian advocacy groups, such as the American Center for Law & Justice (ACLJ); privacy advocacy groups, like the 511 campaign; state-level opposition groups, such as North Carolinians Against Real ID; and Florida, government accountability groups; labor groups, like AFL-CIO; People for the American Way; consumer and patient protection groups; some gun rights groups, such as Gun Owners of America; many state lawmakers, state legislatures, and governors; The Constitution Party; the editorial page of the Wall Street Journal; and the Obama administration, among others. Founded by evangelical Christian Pat Robertson, the American Center for Law and Justice (ACLJ) participated in a joint press conference with the ACLU in 2008, highlighting the broad diversity of the coalition opposing Title II of the Real ID Act. The Real ID Act causes concerns for transgender people as well. The National Coalition Against Domestic Violence has also voiced concern about Real ID. Florida Libertarian Party chair Adrian Wyllie drove without a driver's license since 2011 in protest of the Real ID Act. After being ticketed for driving without a license, Wyllie argued in court that Florida's identification laws violated his privacy rights; this claim was rejected by a judge. Among the 2008 presidential candidates, according to a February 2008 CNet report at news.com, John McCain strongly supported the Real ID Act, Barack Obama and Ron Paul flatly opposed it, while Hillary Clinton called for the law to be reviewed. In a September 2007 interview Mike Huckabee expressed opposition to the Real ID Act, calling the Real ID Act "a huge mistake". The original Real ID Act, H. R. 418, was approved by the House on February 10, 2005, by a vote of 261–161. At the insistence of the Real ID Act sponsor and then House Judiciary Committee Chair F. James Sensenbrenner (Republican, Wisconsin), the Real ID Act was subsequently attached by the House Republican leadership as a rider to H.R. 1268, a bill dealing with emergency appropriations for the Iraq War and with the tsunami relief funding. H.R. 1268 was widely regarded as a "must-pass" legislation. The original version of H.R. 1268 was passed by the Senate on April 21, 2005, and did not include the Real ID Act. However, the Real ID Act was inserted in the conference report on H.R. 1268 that was then passed by the House on May 5, 2005, by a 368–58 vote and was unanimously passed by the Senate on May 10, 2005. The Senate never discussed or voted on the Real ID Act specifically and no Senate committee hearings were conducted on the Real ID Act prior to its passage. Critics charged that this procedure was undemocratic and that the bill's proponents avoided a substantive debate on a far-reaching piece of legislation by attaching it to a "must-pass" bill. A May 3, 2005, statement by the American Immigration Lawyers Association said: "Because Congress held no hearings or meaningful debate on the legislation and amended it to a must-pass spending bill, the Real ID Act did not receive the scrutiny necessary for most measures, and most certainly not the level required for a measure of this importance and impact. Consistent with the lack of debate and discussion, conference negotiations also were held behind closed doors, with Democrats prevented from participating." For more detailed arguments for and against identity cards, see Identity document. There is disagreement about whether the Real ID Act institutes a "national identification card" system. The new law only sets forth national standards, but leaves the issuance of cards and the maintenance of databases in state hands; therefore, the Department of Homeland Security claims it is not a "national ID" system. Web sites such as no2realid.org, unrealid.com, and realnightmare.org argue that this is a trivial distinction, and that the new cards are in fact national ID cards, thanks to the uniform national standards created by the AAMVA and (especially) the linked databases, and by the fact that such identification is mandatory if people wish to travel out of the United States. Many advocacy groups and individual opponents of the Real ID Act believe that having a Real ID-compliant license may become a requirement for various basic tasks. Thus a January 2008 statement by ACLU of Maryland says: "The law places no limits on potential required uses for Real IDs. In time, Real IDs could be required to vote, collect a Social Security check, access Medicaid, open a bank account, go to an Orioles game, or buy a gun. The private sector could begin mandating a Real ID to perform countless commercial and financial activities, such as renting a DVD or buying car insurance. Real ID cards would become a necessity, making them de facto national IDs". However, in order to perform some tasks, government-issued identification is already required (e.g., two forms of ID – usually a driver's license, passport, or Social Security card – are required by the Patriot Act in order to open a bank account). Some critics claim that the Real ID Act violates the Tenth Amendment to the United States Constitution as a federal legislation in an area that, under the terms of the Tenth Amendment, is the province of the states. Thus, Anthony Romero, the executive director of ACLU, stated: "Real ID is an unfunded mandate that violates the Constitution's 10th Amendment on state powers, destroys states' dual sovereignty and consolidates every American's private information, leaving all of us far more vulnerable to identity thieves". Former Republican U.S. Representative Bob Barr wrote in a February 2008 article: "A person not possessing a Real ID Act-compliant identification card could not enter any federal building, or an office of his or her congressman or senator or the U.S. Capitol. This effectively denies that person their fundamental rights to assembly and to petition the government as guaranteed in the First Amendment". The DHS final rule regarding implementation of the Real ID Act discusses a number of constitutional concerns raised by the commenters on the proposed version of this rule. The DHS rule explicitly rejects the assertion that the implementation of the Real ID Act will lead to violations of the citizens' individual constitutional rights (page 5284 of the DHS rule in the Federal Register). In relation to the Tenth Amendment argument about violation of states' constitutional rights, the DHS rule acknowledges that these concerns have been raised by a number of individual commenters and in the comments by some states. The DHS rule does not attempt to rebuff the Tenth Amendment argument directly, but says that the DHS is acting in accordance with the authority granted to it by the Real ID Act and that DHS has been and will be working closely with the states on the implementation of the Real ID Act (pages 5284 and 5317 of the DHS final rule in the Federal Register). On November 1, 2007, attorneys for Defenders of Wildlife and the Sierra Club filed an amended complaint in U.S. District Court challenging the 2005 Real ID Act. The amended complaint alleges that this unprecedented authority violates the fundamental separation of powers principles enshrined in the U.S. Constitution. On December 18, 2007, Judge Ellen Segal Huvelle rejected the challenge. On March 17, 2008, attorneys for Defenders of Wildlife and the Sierra Club filed a Petition for a Writ of Certiorari with the U.S. Supreme Court to hear its "constitutional challenge to the Secretary's decision waiving nineteen federal laws, and all state and local legal requirements related to them, in connection with the construction of a barrier along a portion of the border with Mexico". They question whether the preclusion of judicial review amounts to an unconstitutional delegation of legislative power and whether the "grant of waiver authority violates Article I's requirement that a duly-enacted law may be repealed only by legislation approved by both Houses of Congress and presented to the President". On April 17, 2008, numerous amicus briefs "supporting the petition were filed on behalf 14 members of Congress, a diverse coalition of conservation, religious and Native American organizations, and 28 law professors and constitutional scholars". Many immigrant and civil rights advocates feel that the changes related to evidentiary standards and the immigration officers' discretion in asylum cases, contained in the Real ID Act, would prevent many legitimate asylum seekers from obtaining asylum. Thus a 2005 article in LCCR-sponsored Civil Rights Monitor stated, "The bill also contained changes to asylum standards, which according to LCCR, would prevent many legitimate asylum seekers from obtaining safe haven in the United States. These changes gave immigration officials broad discretion to demand certain evidence to support an asylum claim, with little regard to whether the evidence can realistically be obtained; as well as the discretion to deny claims based on such subjective factors as "demeanor". Critics said the reason for putting such asylum restrictions into what was being sold as an anti terrorism bill was unclear, given that suspected terrorists are already barred from obtaining asylum or any other immigration benefit". Similarly, some immigration and human rights advocacy groups maintain that the Real ID Act provides an overly broad definition of "terrorist activity" that will prevent some deserving categories of applicants from gaining asylum or refugee status in the United States. A November 2007 report by Human Rights Watch raises this criticism specifically in relation to former child soldiers who have been forcibly and illegally recruited to participate in an armed group. A previous version of the Real ID Act (H.R. 418) would have prohibited any judicial review of Homeland Security law waivers for barrier construction. Critics maintained that this would elevate the Secretary of Homeland Security above the law, and this language was changed in the final version (H.R. 1268). Many privacy rights advocates charge that by creating a national system electronically storing vast amounts of detailed personal data about individuals, the Real ID Act increases the chance of such data being stolen and thus raises the risk of identity theft. The Bush administration, in the DHS final rule regarding the Real ID Act implementation, counters that the security precautions regarding handling sensitive personal data and hiring DMV workers, that are specified in the Real ID Act and in the rule, provide sufficient protections against unauthorized use and theft of such personal data (pages 5281–5283 of the DHS final rule in the Federal Register). Another privacy concern raised by privacy advocates such as the Electronic Frontier Foundation is that the implementation of the Real ID Act will make it substantially easier for the government to track numerous activities of Americans and conduct surveillance. Supporters of the Real ID Act, such as a conservative think-tank the Heritage Foundation, dismiss this criticism under the grounds that states will be permitted (by law) to share data only when validating someone's identity. The Data Privacy and Integrity Advisory Committee, which was established to advise the Department of Homeland Security on privacy-related issues, released a statement regarding the Department of Homeland Security's proposed rules for the standardization of state driver licenses on May 7, 2007. The committee stated that "Given that these issues have not received adequate consideration, the Committee feels it is important that the following comments do not constitute an endorsement of REAL ID or the regulations as workable or appropriate", and "The issues pose serious risks to an individual's privacy and, without amelioration, could undermine the stated goals of the REAL ID Act". ^ "REAL ID Enforcement in Brief" (PDF). U.S. Department of Homeland Security. December 20, 2013. ^ "Public Law 109-13 Title II Sec. 201 (3)". Government Printing Office. Retrieved August 26, 2014. ^ "Countdown to REAL ID". National Conference of State Legislatures. December 23, 2013. ^ "Statement by Sec J. Johnson". Homeland Security. ^ a b c d e f "REAL ID". U.S. Department of Homeland Security. April 18, 2019. ^ "HR 1268: Making emergency supplemental appropriations". ^ "U.S. Senate: U.S. Senate Roll Call Votes 109th Congress - 1st Session". www.senate.gov. ^ "States get More Time on National ID Law", Los Angeles Times, January 12, 2008. ^ a b "New rules on licenses pit states against feds". ^ a b c d e f g "DHS REAL ID Final Rule, January 11, 2008" (PDF). ^ "Biometric Bits - Home Page". www.biometricbits.com. ^ "States get 'Real ID' extensions - USATODAY.com". www.usatoday.com. ^ "REAL ID Repeal and Identification Security Enhancement Act of 2007 (2007 - H.R. 1117)". GovTrack.us. ^ "Real ID Public FAQs". December 29, 2013. ^ ""Transportation Security Administration: Information for Travelers"". ^ "Real IDs to Become Real in 2010". Betanews.com. ^ "Real ID Act of 2005, full text". ^ a b Harper, Jim. "What Is Real REAL ID Compliance?". Cato Institute. Retrieved February 24, 2016. ^ "How the REAL-ID Act is creating a national ID database". The Identity Project. Retrieved February 24, 2016. ^ a b "State to State (S2S) Verification Services". American Association of Motor Vehicle Administrators. April 16, 2019. ^ Hakim, Danny (October 28, 2007). "Spitzer Tries New Tack on Immigrant Licenses". The New York Times. ^ Confessore, Nicholas (November 14, 2007). "Spitzer Drops Bid to Offer Licenses More Widely". The New York Times. ^ Gaouette, Nicole (March 2, 2007). "National ID requirements postponed under criticism". LA Times. ^ McCullagh, Declan. "Homeland Security bows to Real ID outcr". CNET News. Retrieved May 30, 2012. ^ "An Act To Prohibit Maine from Participating in the Federal REAL ID Act of 2005" (PDF). Maine Legislature. ^ "Utah Legislature HR0002". Utah Legislature. ^ 'Washington Becomes Fourth State to Oppose REAL ID', ACLU, April 5, 2007. Accessed July 23, 2007. ^ "Congress rethinks the Real ID Act", CNET News, May 8, 2007. Accessed May 19, 2016. ^ 'National ID Cards and REAL ID Act', Electronic Privacy Information Center. Accessed July 23, 2007. ^ 'Gov signs law rejecting Real ID act', Billings Gazette, April 17, 2007. Accessed July 23, 2007. ^ 'Bill Information for SJR0248' Tennessee State Legislature. Accessed August 8, 2007. ^ "Status of Anti-Real ID Legislation in the States", ACLU, Accessed November 4, 2007. ^ "Remarks of the North Carolina Department of Motor Vehicles Commissioner to the North Carolina Joint Legislative Committee on Transportation Oversight, December 12, 2006". National Conference of State Legislatures. December 12, 2006. Archived from the original on June 16, 2008. Retrieved February 7, 2010. ^ "New Illinois licenses needed by 2010 for airport security". Illinois Pantagraph. January 27, 2008. ^ "Press statement". La Fortaleza. July 7, 2008. ^ "Press release: DHS Increases Funding For REAL ID Grant Program and Extends Applications Deadline, January 29, 2008". DHS. ^ By. "Greitens signs Real ID legislation, putting Missouri in compliance with federal law". kansascity. Retrieved April 19, 2019. ^ "Missouri House of Representatives - Bill Information for HB151". house.mo.gov. Retrieved April 19, 2019. ^ "HB 109 - Issuance and Renewal of Driver's Licenses and Identification Cards". Florida House of Representatives. ^ "Senate Bill 220". The Florida Senate. 2012. ^ "Floridians Against REAL ID: Florida Driver's License Citizen Protection Act as of September 19, 2011" (PDF). Liberty2010. Archived from the original (PDF) on January 13, 2012. ^ "House Bill 109". The Florida Senate. 2012. ^ "TRU-ID page". =NJ Motor Vehicle Commission. ^ "ACLU-NJ Wins Round Two of Real ID Battle". ACLU. ^ "State Settles ACLU-NJ Lawsuit by Agreeing to Drop TRU-ID Program". ACLU. ^ "Identification Requirements". Georgia Department Of Driver Services. ^ EndPlay (July 5, 2012). "New law causing hours-long wait at DDS offices". WSBTV. ^ "New driver's license law sure to confuse, slow down process". Hawaii News Now. Retrieved July 24, 2014. ^ "Hawaii Fully Compliant with REAL ID Standards for Drivers Licenses, State Identification Cards". Hawaii.gov. Retrieved July 24, 2014. ^ "DMV to offer Real ID driver's licenses". Dmvnv.com. ^ "Arizona Gov. Doug Ducey signs Real ID bill". KTAR-FM. April 14, 2015. ^ "Secure Arizona driver's license takes step toward reality". AZCentral. ^ "Legislation". New Mexico Legislature. ^ McCleland, Jacob. "Fallin Signs REAL ID Compliance Bill Into Law". KGOU. ^ "With new law, Minnesota becomes the last state to comply with federal Real ID Act". Minnesota Post. ^ "2 million Californians issued Real IDs now need to show extra documentation". ABC7 Los Angeles. December 25, 2018. Retrieved December 25, 2018. ^ Real ID real answers, Massachusetts Registry of Motor Vehicles. ^ "State of Ohio BMV - Ohio's New Driver License and Identification Card". www.bmv.ohio.gov. Retrieved March 6, 2018. ^ "Making Ohio Driver Licenses and Identification Cards More Secure - Fact Sheet" (PDF). Ohio Bureau of Motor Vehicles. Retrieved March 6, 2018. ^ a b "Congress rethinks the Real ID Act". CNET. May 8, 2007. Retrieved July 7, 2008. ^ ccpafl (May 18, 2011). "Florida LP Chairman Adrian Wyllie surrenders license in protest of REAL ID act" – via YouTube. ^ "North Carolinians Against Real ID website". ^ "Floridians Against REAL ID website". Archived from the original on July 6, 2011. ^ Steve Meyer (February 10, 2009). "Real ID Exposed at National Press Club with Mark Lerner, Host" – via YouTube. ^ Beauchamp, Toby (2009). "Artful Concealment and Strategic Visibility: Transgender Bodies & U.S. State Surveillance After 9/11". Surveillance and Society. 6 (4). Jacob Carpenter, Judge to former gubernatorial candidate: Good try, no dice, Naples Daily News (March 2, 2015). Curtis Krueger, Libertarian gets ticketed on purpose to make argument in court Libertarian gets ticketed on purpose to make argument in court, St. Petersburg Times (September 7, 2011). ^ "Mike Huckabee: The RCP Interview". Real Clear Politics. September 25, 2007. Retrieved July 7, 2008. ^ "No Real Debate for Real ID". Wired. May 10, 2005. Retrieved July 7, 2008. ^ "Immigrants' Rights Update, Vol. 19, Issue 2". National Immigration Law Center. March 31, 2005. Archived from the original on October 23, 2005. Retrieved July 7, 2008. ^ "Opposing view: Repeal Real ID". USA Today. March 6, 2007. Archived from the original on February 22, 2008. Retrieved February 15, 2008. ^ "Real ID Act a Real Intrusion on Rights, Privacy". The Atlanta Journal-Constitution. February 6, 2008. Archived from the original on February 12, 2008. Retrieved February 15, 2008. ^ "Border Fence Construction: San Pedro Riparian NCA – Defenders of Wildlife". ^ "Conservation Groups Challenge Chertoff's Waiver Power as Unconstitutional". November 1, 2007. ^ Joe Vickless; Oliver Bernstein (March 17, 2008). "U.S. Supreme Court Asked to Answer: Is Chertoff Above the Law?". Defenders of Wildlife. Retrieved September 16, 2008. ^ Brian Segee; Cat Lazaroff (April 25, 2008). "Congress to hold field hearing on border wall". Defenders of Wildlife. Retrieved September 16, 2008. ^ "Wildlife and Border Policy". Defenders of Wildlife. April 2008. Retrieved September 16, 2008. ^ Joe Vickless; Cat Lazaroff (April 18, 2008). "Congressional, religious, cultural and academic leaders urge Supreme Court to hear challenge to border wall". Defenders of Wildlife. Retrieved September 16, 2008. ^ a b "Anti-immigrant 'REAL ID' Act Becomes Law". Civil Rights Monitor. 15 (1). Fall–Winter 2005. ^ "The 'REAL ID' Act Is a Really Bad Idea" (PDF). National Immigration Law Center. March 2005. Retrieved February 16, 2008. ^ "AIUSA Issue Brief: The REAL ID Act of 2005 and Its Negative Impact on Asylum Seekers". Amnesty International USA. March 2005. Retrieved February 17, 2008. ^ "United States of America: Compliance with the Optional Protocol to the Convention on the Rights of the Child on the involvement of children in armed conflict" (PDF). Human Rights Watch. November 2007. Retrieved February 17, 2008. ^ "ACLU Scorecard On Final Real ID Regulations" (PDF). ACLU. January 17, 2008. Retrieved February 17, 2008. ^ "Real ID Act Will Increase Exposure to ID Theft". Privacy Rights Clearinghouse. February 28, 2007. Retrieved February 17, 2008. ^ "The Many Faces of the Real ID Act". PrivacyActivism. February 28, 2007. Retrieved February 17, 2008. ^ "Real ID Act mostly helps identity thieves". San Jose Mercury News. May 19, 2005. Retrieved February 17, 2008. ^ a b "Federal ID plan raises privacy concerns". CNN. August 16, 2007. Retrieved February 17, 2008. ^ "Real ID. Threatening Your Privacy Through an Unfunded Government Mandate". Electronic Frontier Foundation. August 16, 2007. Retrieved February 17, 2008. ^ Ryan Singel. May 7, 2007. Homeland Security's Own Privacy Panel Declines to Endorse License Rules. Actual proposed rules Search ID: DHS-2006-0030-0001 Click on "Docket ID" for commentary. Report: No Freedom Without Privacy: The Real ID Act's Assault on Americans' Everyday Lives, an NYCLU report on the Real ID Act's impact on civil liberties. This page was last edited on 19 April 2019, at 19:59 (UTC).